Did I get reamed out this morning for not writing something about the Kardashian/Humphries wedding this weekend? Yes, yes I did. How ridiculous. So here you go. I found something worthy of my time. A little kid stole the show in this CNN report on the wedding. Props. At the end he runs away and it looks like he got caught or called away. I really hope it was his parents and they gave him a giant high five for his hilarious efforts. 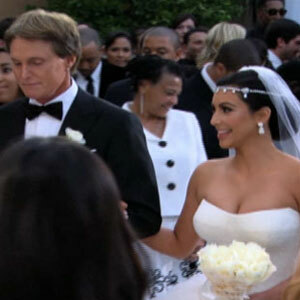 Below is a picture from the wedding...I only put it up because Bruce is in it and he is my fave. I am assuming there is some sort of exclusive for the actual wedding photos...so look at them later and know that your interest is putting her children and her grandchildren through college.